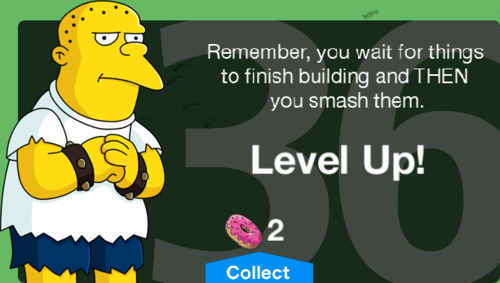 ← 033 "Treehouse of Horror XXIV"
The Simpsons: Tapped Out Level 36 content update is the The thirty-forth content update for The Simpsons: Tapped Out and was released on October 23, 2013. It included two characters, Dolph and Jimbo. Two buildings, Museum of Natural History and Noiseland Video Arcade and one decoration, the Stolen Bumper Car. I'm not feeling school today. Even the wedgies seem. educational. Yeah, I've started calculating the potential return and reinvesting lunch money in the current marketplace. Let's get out of here before we learn anything! My kid's at daycare until three, so I'm in. Hey, I only heard two yeses. Where's Dolph? At the arcade. He's been wasting his time playing some mindless video games for nonexistent rewards. He's really good. He's on level 36, but I'm only on level 21. The player receives "Running With The Bullies Pt. 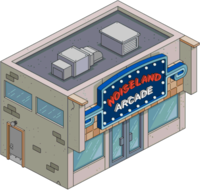 1" which is to "Build the Noise Land Video Arcade". It takes 24 hours and the player receives total 100 and 10 in reward. This Turbo Bully 2 game is totally unrealstic. Three gut punches are way stronger than a double wedgie. And I wasted a ton of money on Interactive Wall Street. Man, I hate social commentary. Let's go not live up to our potential somewhere else. You got a lighter? Nah, but the Kwik-E-Mart's got them on four-finger discount. Okay, I'll keep Apu busy with my panted Nelson diversion - dropping a Squishee on the floor. The player receives "Running With The Bullies Pt. 2" which is to "Make Nelson Shop at Kwik-E-Mart" and "Make Dolph Shoplift". It takes 60 minutes and the player receives total 240 and 44 in reward. Bart Simpsons, it's time to do something fun that you've been avoiding all day – clean your room. Wish I could but I've got actual fun to do. We'll make it a game – folding clothes lets you move two squares, removing anything with mold transports you to vacuum city where you battle the dust bunnies. The player receives "Running With The Bullies Pt. 3" which is to "Make Bart Skateboard". It takes 4 hours and the player receives total 275 and 55 in reward. The cops are on to us! Cheese it! They can smell our fear… or more likely, our Squishees. I can't move that fast. I'm loaded down with factory damaged Krusty O's. They're sharp! Hey guys, I thought you said running was for losers, chumps, and Usain Bolt. Buzz off, Simpson – we've gotta find a place to lay low fast. Then allow me to be your accomplice. I know your the perfect spot. The player receives "Running With The Bullies Pt. 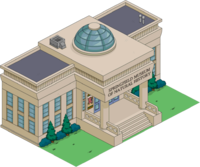 4" which is to "Make Bart Hide Out in the Brown House", "Make Nelson Hide Out in the Brown House", and "Make Dolph Hide Out in the Brown House". It takes 24 hours and the player receives total 1,900 and 460 in reward. Nice move, Simpson. I almost regret giving you that swirlie. You said there was a spider in my hair! I can't take any more learning. Each time I learn a state capital I forget a cuss word. Let's ditch and get the huck to Trenton! I can't – I'm in the Betsy Roos These Colors Do Run 5K today. I'm heavily favored for fourth place! I understood very little of that sentence. What about you, Simpson? I've waited my entire life for this. You're asking him? He doesn't even slouch properly! Whatever. Have fun not earning a medal, Starbeam. The player receives "Running With The Bullies Pt. 4" which is to "Make Nelson Play the Guitar", "Make Bart Skip School", and "Make Dolph Torment Classmates". It takes 8 hours and the player receives total 925 and 220 in reward. Guys, want to see my new skateboard trick? I call it the Roundhouse Bartwheel. Who wants to watch Simpson break his neck? I'm hoping. I'm hoping for carnage. I'm hoping for embarrassment. Bones heal but emotional damage lasts forever. The player receives "Running With The Bullies Pt. 6" which is to "Make Bart Skateboard". It takes 4 hours and the player receives total 275 and 55 in reward. 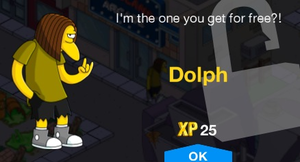 Nice moves, Simpson, but Dolph is already our gang's daredevil. That's right. I turn on my cell phone like ten minutes before the plane lands. But I'm cool! Just give me a chance to prove it. Fine. Come trash the Kwik-E-Mart with me and we'll see who causes the most mayhem. Or we could see who can write the most strongly worded comment card for the Kwik-E-Mart's suggestion box? I'm not a chicken! I'm just saying I know some harsh action words. The player receives "Running With The Bullies Pt. 7" which is to "Make Dolph Vandalize the Kwik-E-Mart" and "Make Bart Vandalize the Kwik-E-Mart". It takes 12 hours and the player receives total 850 and 150 in reward. You really outdid yourself, Dolph. The colors, the shading, the depth of your trash job really shows. But I think Simpson's graffiti's got you beat. He put the art in Simpson. Thank guys, I was going for a small man's view of a larger, uncaring world. With butts. What? No damaged merchandise, no broken displays, no stolen goods. Is this even a misdemeanor? Forget you guys — I'm out of here! The player receives "Running With The Bullies Pt. 8" which is to "Make Dolph Act Out Aggression". It takes 12 hours and the player receives total 520 and 110 in reward. Bart Simpson thinks he's so cool with his skateboard and 90′s catchphrases. I can have a catchphrase too! Like… “slam it down, Liberace!” Ok, maybe not that one. I'll show the gang what a wuss Bart is once and for all. Hey Dolph. Come back for another art lesson? Just wanted you to know that the guys are starting to think you're lame. And stupid. And have a fat head. But maybe you could change their minds if you did something awesome, like trash the kitchen at Luigi's. Wow, that's really specific. But sure, thanks for the advice, Dolph. The player receives "Running With The Bullies Pt. 8" which is to "Make Bart Mess with Luigi's Recipe". It takes 8 hours and the player receives total 375 and 80 in reward. Mamma-mia! My spaghetti, it's a-ruined! Ah, the perfect evening to indulge in my two favorite Italian traditions – pasta and extortion. Luigi, tell me, how is business? You know you'd save more money if you bundled. It's no good. Someone trashed my kitchen. All my horse meat, she is ruined. Hmm. Nobody threatens local businesses except for me. And in your case maybe the health inspector. The player receives "Running With The Bullies Pt. 10" which is to "Make Fat Tony Have A Dinner Special at Luigi's". It takes 4 hours and the player receives total 275 and 55 in reward. You're right, Luigi, the food was truly disgusting. Worse than usual even. I'll ask around in the community and find out who sabotaged your kitchen. And then I will make them suffer... just as I had to suffer by eating here tonight. The player receives "Running With The Bullies Pt. 11" which is to "Make Business Owners Check in with Fat Tony (x5)" and "Make Fat Tony check in with Business Owners". It takes 12 hours. My sources point to a gang of schoolyard bullies. Looks like they just graduated to the big leagues. Legs, Louie, I want you to find these kids and give them a lesson in economics. Make sure it doesn't go over their heads. Finally some acknowledgement for my Masters in Fiscal Studies. All those night school classes. I think he just wants us to shake 'em down, Legs. But we're all still proud of you. The player receives "Running With The Bullies Pt. 12" which is to "Make Legs Threaten Bullies" and "Make Louie Threaten Bullies". It takes 8 hours and the player receives total 650 and 150 in reward. Hey Simpson! A couple of mobsters just shook us down for our shake-down money. You know how much I hate irony. They said you trashed Luigi's. And I was only two stamps away from a free chicken parm! If Dolph told you to jump off a bridge, would you do it? Get him, Jimbo, and toss him off a bridge! The player receives "Running With The Bullies Pt. 13" which is to "Make Bart Hide From Bullies". It takes 24 hours and the player receives total 700 and 160 in reward. Man, I don't know what's worse, running from the mob or the bullies. Well, the mob obviously. What am I going to do? Hey Bart, hold up a sec. What do you want me to do this time, Dolph? Steal the head of Jebediah Springfield, become a national enemy of Australia, sell my soul? Well, you can't because I already did those. Look, I set you up at Luigi's but I thought the mob would just rough you up a bit, maybe cut off a few fingers. But now, they're after all our fingers! And just when Kearney's hand modeling career was taking off. This is bad. Why didn't anyone ever try to warn me that there could be repercussions for my bad behavior? Don't worry — I've got an idea! Let's get some of those honor roll dweebs to think of an idea for us? The player receives "Running With The Bullies Pt. 14" which is to "Make Bart Get Help From Lisa", "Make Lisa Help Bart", "Make Dolph Get Help From Martin", and "Make Martin Help Dolph". It takes 24 hours and the player receives total 1,780 and 410 in reward. Martin and I don't like being forced into solving your problems. But we do like solving problems, so we came up with a plan anyway. To rectify the situation, we must incorporate a method of rapid profit generation to replace lost revenue for the establishment in question. I want to hit you but I don't understand why. Bart hurt Fat Tony's profits, so we make it up to him by drumming up lots of business for Luigi's. Way to go, sis! You've done it again. You know, for most sisters, rescuing their brother from the mob would be out of the ordinary. To do list time! Step one – make a to do list. Step two – tell Bart and Dolph about to do list. Check. Step three – Dolph, you distract the gang from finding Bart. Step four – Bart, you make things right with Fat Tony. Can't I just start my own civilization down in the sewers? No Bart! Tell him our plan. When he sees how it will benefit Luigi, he's sure to let you off the hook. Okay. And then I go live in the sewers? The player receives "Running With The Bullies Pt. 15" which is to "Make Fat Tony Take a Legitimate Business Meeting" and "Make Bart Attend a Legitimate Business Meeting". It takes 30 minutes and the player receives total 180 and 30 in reward. Bart Simpson, I admire the courage it took for you to come to me… and your casual but stylish attire. I am willing to break only one of your legs now and leave the other until we see if your plan works. The plan kind of needs both of my legs unbroken, sir. You drive a hard bargain, Mr. Simpson. But very well. Zero legs upfront… but three legs later if you plan fails. Capeesh? Okay, Poindexter, one more time, explain to me how this is all supposed to work. Using elementary perceptive and emotional cues, we establish subliminal suggestions to Springfield's recreational population. You and Dolph will use advertising and publicity stunts to get people to eat at Luigi's. My rhetoric was clearly miscommunicated if it's implications weren't identical to that. The player receives "Running With The Bullies Pt. 16" which is to "Make Citizens Eat at Luigi's (x20)". It takes 8 hours. Martin, look! It's working! People are going to Luigi's! Of course it's working. Another classic example of psychologically induced herd mentality! It's amazing how advertising works on people. It's just like pushing a button... 20 times on a screen. Hey guys, I saved the day! I guess this makes us even, right? Why are you making a fist, Nelson? There. Now, we're even. Come on, lets get out of here before he thinks he's one of us again. The player receives "Running With The Bullies Pt. 17" which is to "Make Nelson Laugh at the Misfortunes of Others" and "Make Dolph Loiter with an Adult Magazine". It takes 24 hours and the player receives total 1,300 and 310 in reward. The player receives "Rebel Without A Pause Pt. 1" which is to "Make Jimbo Complain about Cafeteria Food". It takes 8 hour and the player receives total 520 and 115 in reward. The player receives "Rebel Without A Pause Pt. 2" which is to "Make Jimbo Incite A Food Fight". It takes 4 hour and the player receives total 360 and 80 in reward. The player receives "Rebel Without A Pause Pt. 3" which is to "Make Jimbo Hacky Sack a Frog". It takes 12 hour and the player receives total 700 and 160 in reward. The player receives "Rebel Without A Pause Pt. 4" which is to "Make Lisa Blog About Amphibian Rights". It takes 24 hour and the player receives total 700 and 160 in reward. The player receives "Rebel Without A Pause Pt. 5" which is to "Make Jimbo Get a Four-Finger Discount". It takes 60 minutes and the player receives total 160 and 25 in reward. The player receives "Rebel Without A Pause Pt. 6" which is to "Make Jimbo Skateboard". It takes 24 hour and the player receives total 1,100 and 235 in reward. The player receives "Rebel Without A Pause Pt. 7" which is to "Make Jimbo Sneak Into Church". It takes 4 hour and the player receives total 360 and 80 in reward. Modified on April 27, 2017, at 08:09.